This technical centre will focus on development and localisation of the MQB A0 IN - platform for future Volkswagen & Skoda models in India. The first concept will be showcased at the Auto Expo 2020. In July last year, Volkswagen Group announced their new India 2.0 project. The Volkswagen Group intends to invest ₹7900 crore in the next two years for future growth and development of new products. Taking a step in the direction, Skoda and Volkswagen Group India inaugurated a new Technology Centre at their factory in Chakan. 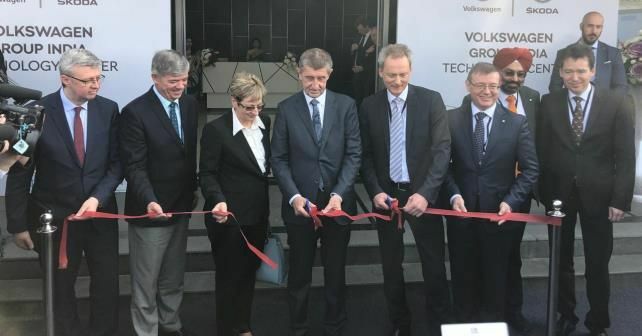 The Technical Centre was inaugurated by Andrej Babis, Prime Minister of the Czech Republic, in the presence of other members of his government and Gurpratap Boparai, Head Volkswagen Group India. Also present during the inauguration ceremony were Christian Strube and Bohdan Wojnar. This technical centre will be the bedrock for the development of new products in the future. It is here that the India-specific MQB A0 IN will be developed. 250 engineers will be developing vehicles specially crafted to meet the needs of Indian customers. To ensure that their pricing is competitive, products developed under the India 2.0 project aim at 95% localisation. “The technology centre will lay the foundation for the development of products that are specially designed for the India market. We expect to roll out the first products, for both the Skoda and Volkswagen brands, by 2020 – 2021, starting with a mid-sized SUV based on the MQB AO IN platform. A model campaign led by Skoda will follow. I am convinced that we can use all the strengths of Skoda to the great benefit of the entire Volkswagen Group,” said, Gurpratap Boparai, Head – Volkswagen India Group.